Take two parts big band swing and one part rock-and-roll, add a jigger of Sinatra and a pony of Stevie Ray Vaughn, and what do you get? the nation’s top party band! Whether you’re looking for Dallas Jazz Bands or Dallas Party Bands for your Dallas wedding, charity event, corporate party, trade show, or concert, Big-T will transform your function into a night at the Sands! Book one of the top Dallas Bands! 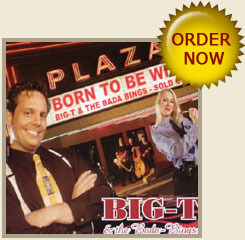 Choose Big-T and the Bada-Bings when looking for Dallas Party Bands or Dallas Wedding Bands. 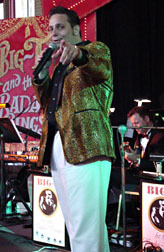 Based in Texas, this 10- or 17-piece Big Band regularly travels from Dallas to Austin, Houston, San Antonio, and Oklahoma, blending a unique mixture of Blues, Swing, Big Band and Classic Rock to deliver a guaranteed good time. Big-T himself combines the soul of B.B. King with the swagger of Tony Soprano and the vocal chops of Ol’ Blue Eyes. Listed by the top meeting planners, event planners and talent agents, he’s Dean Martin, Bobby Darrin and Buster Poindexter rolled into one, backed by a pipin’ hot band that’ll knock your socks off. Add a whiff of cigar smoke and a fifth of bourbon, and Bada-FREAKIN-Bing, you’ve got yourself a party! Still need convincing? Follow the links above to read the reviews or listen to samples off Big T’s debut CD, Born to Be Wild. You’ve found your band in Dallas, Texas. You’re one of us, now, baby. FUGGHETABOUTIT! “The perfect road trip accessory! Born to Be Wild, today!